Janet Wickell. The Spruce Crafts, 2007. I used four different fabrics to make the Flying Geese variation quilt block. A dark green print for the points of the darkest geese. A medium-gold print for the slightly lighter geese points. A blue swirled print with just a touch of green for my center square and the corners of half square triangle units. Your fabrics will differ, and your starting point for dark might be darker or lighter than mine. Don't worry about that and don't be influenced by my color choices. 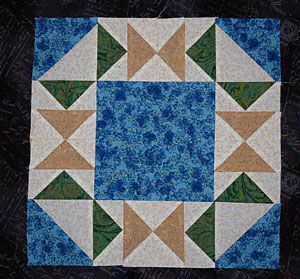 Use your focal fabric as a guide when choosing fabric for your block. There are no rules. There are many ways to make Flying Geese units, but we'll sew squares to corners of a rectangle, then cut off the excess and press. Cut a 3-1/2" x 16-1/2" strip of dark fabric; square up one end and cut eight 2" x 3'1/2" segments from it. Cut a 3-1/2" x 16-1/2" strip of medium-dark fabric; square up one end and cut eight 2" x 3'1/2" segments from it. Cut a 2" x 42" strip of fabric reserved for geese backgrounds. Cut another strip that measures 2" x 25". Square up an end of each and cut thirty-two 2" squares. Note: We're constructing Flying Geese units, but look at the two gold geese that point at each other. They could be made as quarter square triangle units in an unfinished size of 3-1/2". Use a pencil or permanent marker to draw a diagonal line from one corner to the opposite corner on each of your thirty-two 2" squares. Place a square right side down on one end of a Flying Geese rectangle, carefully aligning the edges of both pieces. Hold together with a straight pin placed away from the marked line. Sew a seam on the marked line, and then trim off the corner, leaving about a 1/4" seam allowance past the seam line. Press the seam allowance towards the darker fabric. Repeat to sew another square to the opposite side of the rectangle, making sure the square's marked line is aligned as shown above so that it forms a "peak" with the first sewn corner. Trim excess corner fabric and press. Repeat to assemble sixteen Flying Geese units. To speed things up, chain piece a square to one side of each rectangle, trim and press all, and then chain piece squares to the opposite sides of rectangles. Set aside. Mark a diagonal line on both 3-7/8" background squares, just like you did the smaller squares. Pair the squares with the darker 3-7/8" squares and follow the instructions for making sandwiched units to sew four triangle-squares. The method isn't quite the same as we used for Flying Geese, so be sure to refer to the instructions if you are not familiar with the technique. Sort your flying geese into two piles — a pile for each color. Select a unit from the darkest geese pile and place it right side up on your sewing table. Place a unit from the less dark pile on top of it, right sides together and matching edges carefully. The geese triangles should point the same direction. Sew the two together with a 1/4" seam allowance along the edge where background triangles meet. Press the seam allowance away from the background fabric. Inspect the unit to make sure the darkest geese unit is on the bottom when aligned points upward as shown above. Make a total of eight identical 2-geese units. Sew two 2-geese units together so that their points face towards each other as shown above. Press the seam allowance either direction. Repeat to make a total of four identical 4-geese units. Assemble the units into three rows as shown above. Press seam allowances in the center row towards the large square. Press the outer seam allowances in top and bottom row towards the triangle square units. Sew rows together, butting intersecting seams to help them match. Check your block with a large square ruler; it should measure 12-1/2" square (the extra 1/2" accommodates seam allowances).